Synopsis: A family moving into a new house are disturbed by strange things happening. When their son falls into a coma they need to look for help from paranormal investigation team. I thought the film was very good at building up the tension through the first two-thirds of the film. Rose Byrne and Patrick Wilson really were very convincing as the desperate parents trying to get help for their son. Lin Shaye was lot less bizarre as the medium brought into to help than the unearthly Zelda Rubenstein in Poltergeist, at least she was until she put a strange gas mask to talk to spirits. Perhaps the rush of events just left no room for the quiet tension that was so effective earlier and the last third of the film was a bit of let-down. 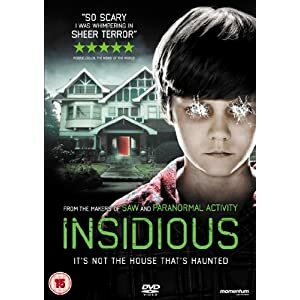 Despite that is still a very good film and I think it is better than Poltergeist, especially as horror film.